Released with pink rim label design and envelope-style cover. The "stamp" portraits on the cover are pasted on, not printed. On Side One All Right Now was recorded live at Sunderland. I'm A Mover / Be My Friend / Fire And Water live at Croydon. On Side Two Ride On Pony / Mr Big were recorded live at Croydon, The Hunter was recorded live at Sunderland. Get Where I Belong is an Island Studio recording (March 71). "Mr Big" appears on sleeve; "Mr. Big" appears on label. 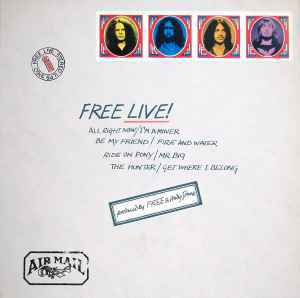 Title on cover: Free Live! Nelson'll always be part of Us.